A bit of background: Reinhold Messner is, as you may know, a famous, record-breaking mountaineer. He was the first to climb Everest without supplemental oxygen, he was the first to climb all of the 14 eight-thousanders, and many other incredible feats. However, in the mid-to-late 1980s, he became the target of much mockery when the media picked up an interview in which he apparently claimed to have seen a yeti (which is not what happened, as this book explains). When I first saw the book, I must admit that I rolled my eyes. I looked at the title and thought “Oh, dear. Here we go – it’s the story of Reinhold and his Yeti.” Still I was intrigued, and now I am glad to have read it, because it is not what I expected. While it is about Messner’s encounter with an unidentified creature, he does not claim the creature to be a yeti. The book actually takes a look at the myth of the yeti while investigating what the creature he saw might have been. He also looks at why the story made the headlines and how the mis-reported interview caused a rather cycnical reception. Why this skepticism? The answer is simple enough: explorers and discoverers see what they want to see. Like all of us, they perceive reality through their own preconceptions. Messner’s descriptions of his trekking and travelling in Tibet is phenomenal. He clearly loves the place and has a lot of respect for its land, people, and culture. His knowledge of the area is remarkable, and he comes across a fairly grounded person – except when he thought his girlfriend left him stranded in Lhasa. He visits many different areas and interviews locals about the yeti myth. His conclusion is that the yeti exists only as a myth, but that the creature he encountered was likely a rare Himalayan bear. This book was published in 1998. Since the time of the precarious interview with an Indian newspaper in 1986, Messner had been subjected to quite harsh ridicule, and his credibility as a writer and mountaineer really suffered. Considering this undeserved treatment and considering that Messner’s theory of a rare bear as the origin of the yeti myth, it has been satisfying and delightful to learn that the scientific community now (in the last month or so as I am writing this) seems to consider Messner’s idea as a valid explanation. Well done that man! Still, even with the latest articles supporting Messner’s ideas, it is still worth reading this book. Messner’s writing in parts is absolutely gripping as he avoids being arrested by the Chinese police, or as he walks across Tibet by himself with nothing but a backpack and a sleeping bag (not tent). The other part that I found really gripping was the part where he described his observations of the Chinese regime in Tibet. He gives some background to the political situation of his visits at the time that the book is referring to but he also adds his first hand experiences. As I have learnt from this (and his Everest book), he doesn’t hold back and he doesn’t seem to embellish, which makes the paragraphs on Tibet quite a decent work of journalism (in any case much better than what I encountered in Forensics recently, not that this is a high bar to set). Not long after this scene, the Chinese government closed Tibet to foreign journalist as the number of protests in Tibet increased. 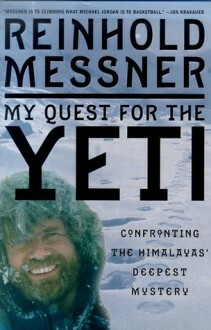 Incidentally, this prevented Messner from being able to conduct more research into the yeti myth for a number of years. For clarity, Messner’s concern in the book is not for the disruption to his project for the welfare of the people in Tibet. Not that he spends much time on political issues, but, as I mentioned earlier, he has a very high regard for the country and its people. I found Messner’s writing about Tibet absolutely riveting. In many ways, I could not help comparing it to Heinrich Harrer’s book Seven Years in Tibet, which is an equally riveting story. Both books show their authors concerns for the country, and though they have been written in different times, they shared a common outlook. As far as books go, this was one of the most surprising reads this year, and I love that the books has changed my own preconceptions of the author. This sounds very interesting- great review!